THIS SATURDAY AUG 6th @ AB SPORTS CONCORD MALL…. This Saturday August 6th, I’ll be signing books at one of the finest collectible stores in the country AB SPORTS at CONCORD MALL in Delaware(302-478-1993). The guys at AB SPORTS are well respected, and it’s great to be working with them on this book signing. I’ll be there at 1PM on Saturday, hanging out , and talking baseball, so be sure to stop by. This past week at the ballpark, I had the chance to meet sculptor Lawrence Nolan. 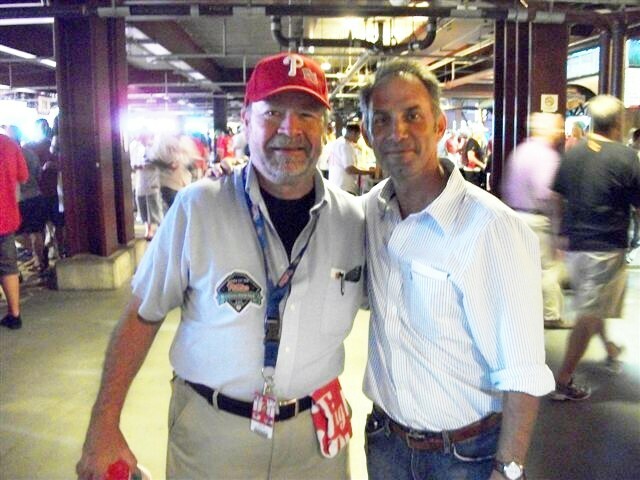 Larry is the man behind the Harry Kalas statue that will be installed at Citizens Bank Park on Sunday Aug 14th @ 1PM. The team is going to put the statue right by Harry the K’s in left field. How long before the refrain will be “meet me by the Harry statue”? 2 Responses to THIS SATURDAY AUG 6th @ AB SPORTS CONCORD MALL…. Happy to see you finally wrote “the book”. Best to you, will read it track you down and get it signed.